Here are the annual figures for the garden yields for the period of Oct 2010 – Oct 2011, the garden’s third year. The annual production for this garden was 131kg in the first year, 202kg in the second year and 194kg in the third year (as a consequence of a minor disaster!). The total garden bed area is 686 sq. feet (64 sq. metres). The average monthly amount of produce was just over 14kg. The most significant anomaly is the “flat-spot” in August, this is what happens when you get seriously ill, are confined to bed, and can’t harvest anything for a month. Things like this really do happen in a real-life garden! As I mentioned in my previous article – 20. Spring and Summer Weather Extremes , Cyclone Yasi struck Australia – this category 5 tropical cyclone hit North Queensland on February 3, 2011 and caused major disruptions to the weather further south here in Melbourne. As a result, our weather changed from a hot, dry Mediterranean summer to a hot, wet, tropical one. We experienced an unseasonably wet spring and an early summer, which has then made a reversal into cold weather, and then reverted back to summer heat. If that wasn’t bad enough, for the first time we’ve experienced what you’d call tropical weather, a period of very hot weather with continuous rain. In Victoria, commercial growers lost up to one-third of their early season stone-fruit and wine grape growers expect to lose one-fifth of their yields because they experienced the worst downy mildew outbreak in 20 years. they only managed to rescue their harvests by extensively spraying with fungicides! It’s fairly easy to calculate the harvest losses for this year. Stone fruit – I counted 52 full sized nectarines and 38 full sized peaches rotting on the ground under the trees. If I very conservatively estimate the weight of these fruit at 100 grams, we are talking about (52+38)x100=9000g, that’s 9kg of stone fruit. Grapes – there were over 9kg produced last year, and the grape vine has been steadily increasing its harvest. If we once again conservatively assume that it would have produced at least as much as it did the year before, then that’s 9kg of grapes. Tomatoes – since there was virtually no summer this year, expectedly, tomato yields reduced from 15kg last year to 8.5kg this year, so that’s a loss of over 6kg of tomatoes. There were other losses, such as other vegetables, cherries, about three weeks worth of raspberries, but I wont bother counting this for now. If I add up our figures for lost harvest, 9kg of stone fruit, 9kg of grapes and 6 kg of tomatoes adds up to a severely underestimated harvest loss of 24kg. If I add this figure to the harvest total, 24+194=218kg, which would have been 14kg more than last years harvest figure at the very least, but hey, this is the real world, and disasters do happen. Essentially. this represents a 4.7% loss in harvest, but from a more positive perspective, it shows that the garden design is rather resilient and we were able to harvest 95.3% of our usual amount of produce even with a major disastrous weather change. I’ll count myself lucky that I have a biodiverse food forest, unlike the commercial monocultures, where commercial growers lost up to one-third of their early season stone-fruit. That’s the benefit of polyculture vs. monoculture folks! If we break down the figures by type of produce (fruits, vegetables and berries), we can see the how much produce we got in each of these categories. This year, fruit production decreased by almost 8%. This decrease is expected, as all the grapes, cherries and stone fruit were lost due to unseasonal weather. The biggest contributing factor though was a major pruning of the pomegranate tree, last year it produced 47kg, this year it only produced less than 7kg, but then again, more than 2/3 of the tree was pruned away! I have planted a few new fruit trees, so there are still many young trees that still have not established themselves yet. My pear trees are now three years old now and might produce their first fruit this year. It appears that fruit trees take around five years to establish and give reasonable yields, and it is evident that yields increase progressively from year to year as the trees mature. The performance of the berries is once again outstanding this year, as it was in the last year. Last year yields have increased by 56%, this year they increased by a whopping 77%. This berries I added last year – youngberries, thornless blackberries, loganberries, thornless gooseberries, black currants, red currants and golden currants are growing well. I’ve added a few more this year, some boysenberries, silvanberries, lawtonberries and marionberries! I’m expecting next years berry harvests to be phenomenal! This year I actually got exactly the same amount of vegetables as the year before, that’s 70kg, even though I couldn’t harvest anything for a whole month being bedridden with a bad fever, I forgot to harvest nearly all of my potatoes (they re-sprouted after being left too long in the soil!) and most of the annual vegetables ‘bolted’ and went to seed after we had a two or three extremely hot days during a very mild spring. 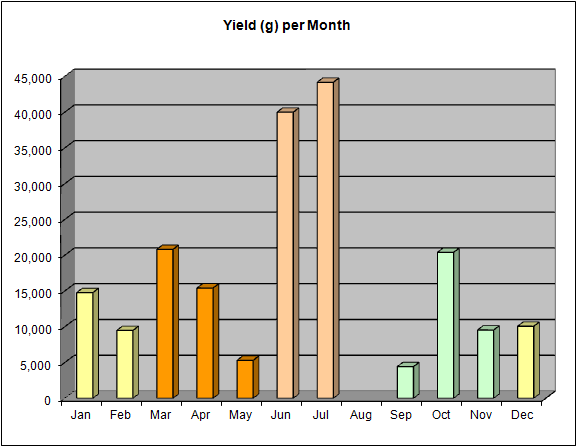 To get some perspective on these yield statistics, we see that production is commonly measured in terms of yield/acre. Without the harvest losses, the theoretical yield per acre: 218×63.23 = 13,784kg/acre, almost 14 metric tonnes per acre. So, my 3 year old garden that is just getting started is producing the equivalent of 12,773kg/acre, in other words, close to 12.77 metric tonnes per acre! Now that I’ve added a few more trees – a mango, another babaco, a persimmon, and another half dozen varieties of berries, I’m curious to see how the garden will perform over the next two years, even in adverse weather conditions. Also. in case people miss this fact, this garden is completely organic, no pesticide was used this year at all. I’ve used a bare touch of organic neem horticultural soap or white oil in previous years, but absolutely none was required this year. Fertilizer was provided courtesy of my three worm farms and five compost bins, and a few bags of sheep manure to replace the nutrients lost from the produce I give away! The fruit trees are starting to fruit once more as summer arrives once again, the berries are beginning to grow quite vigorously, and by all appearances it’s promising to be better than ever this coming year! A fabulous piece of data gathering, and shows how efficient Jerusalem artichoke and Yacon are in food production. I had so much JA last season I passed it on to a local fruit and veg shop, and should have about 30kg of it come Autumn. Was at your place this Winter, and if you are ever out around Bentleigh way let me know so I can return the favour. Yes, root crops are the most productive land plants, they provide excellent returns from a small space! I was there with Shane and want to thank you for the rhubarb and raspberry plants. Currently harvesting my first boysenberries and am amazed at the amount of fruit I’m getting.Just magic! You’re welcome, glad the raspberries have gone to a good home! So wonderful and plentiful information you have put together for a newbie garden enthusiast like me. Thanks a bunch ! I am in a sub-tropical temperate climate of san francisco bay area planning to put some gooseberries and currant. But I was told my climate may not be cold enough for them, same way not hot enough for tropical fruits. How do you pull off growing babaco and currants in the same garden? Currants need a specific number of hours of cold, a ‘chill period’ for them to produce. We have fairly cold winters (without frost) and very hot summers (but unfortunately quite short). Each climate has its challenges! You can try growing sub-tropicals, and ‘low chill’ varieties of plants and trees that require a winter chilling period. There are some low chill currant varieties out there that may be worth a try.